Peaches are one of the best fruits grilled and are positively dynamite in this salad. Simple grilled chicken breast are seasoned with ground ginger, garlic and slat and pepper and paired with salty parmesan cheese, buttery pecans and the sweet grilled peaches. 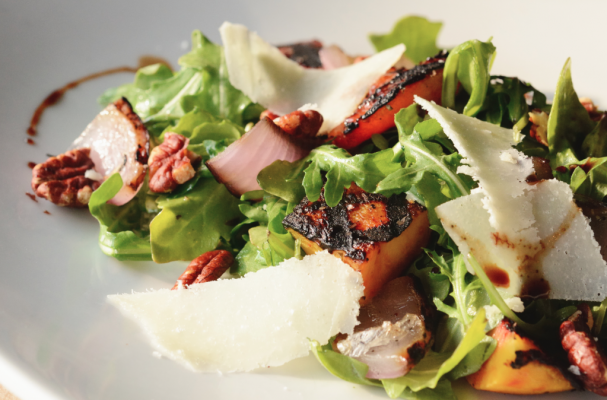 A homemade white balsamic peach vinaigrette brings the whole dish together. This quick and easy meal is not only delicious but also a healthy summer dish. Heat grill on high, setting the grill rack 4 to 6 inches above heat source. Season chicken with ginger, garlic, salt and pepper and lightly coat with olive oil . Grill the chicken, turning it only once, until it feels firm and reaches an internal temperature of 165°F, approximately 10 to 15 minutes. Once cooked, transfer chicken to a cutting board and let it rest. While the chicken is resting coat peaches and onion slices with olive. Grill the onion and peaches starting with skin side up. Only turn them once. Take the peaches off the grill while still a bit firm and not mushy. In a salad bowl, whisk mustard, peach preserves, white balsamic vinegar, olive oil and 1 tablespoon water. Toss with mixed greens. Add the parmesan cheese and pecans and lightly toss again. Serve slices of grilled chicken, peaches, and onion on top.